It’s no secret. My favorite part of every meal is dessert, and this is doubly true at the holidays! I love holiday cookies of every kind, but for New Year’s Eve, I like to make something a little more special. And by special, I mean chocolate. 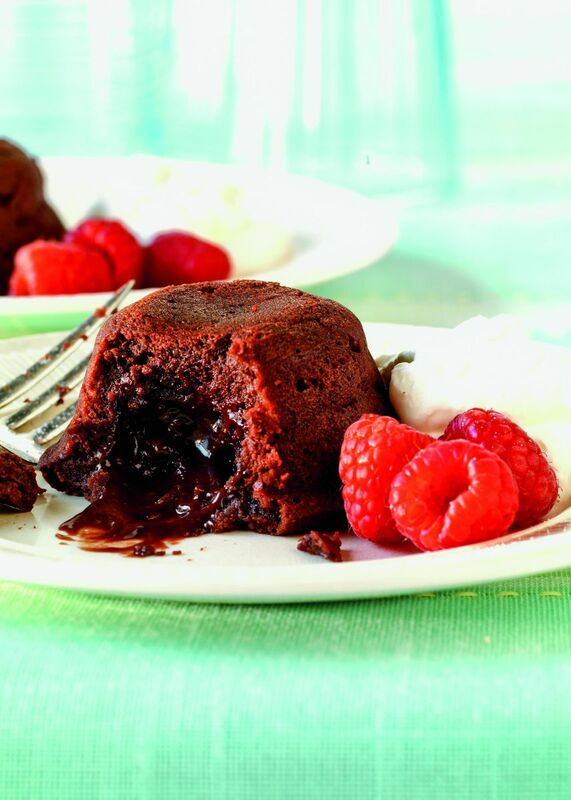 To me, there is nothing more decadent than a molten chocolate cake. It’s rich, delicious, and makes a definite impression on your guests. I’ve used our recipe in New Real Grilling many times, and it doesn’t disappoint. It’s made from ingredients you most likely already have at home, and it’s easy to make, but your guests will be impressed – especially when you tell them it’s grilled. Two bonuses – this recipe can be made in advance and kept in the fridge for a few hours, and baking it on the grill means no mess in your kitchen during the holiday festivities. If you want to up the flavor even more, grill your berries over medium heat in a preheated grill basket for 3 to 5 minutes. It’ll bring out the sweetness even more and really balance the bittersweet chocolate in the cake. Or, if you want to keep it simple, just top your cakes with a dollop of whipped cream or a dusting of powdered sugar. However you serve them, these cakes will be a delicious way to ring in the new year! Happy Grilling, and Happy New Year! 1. Using ½ tablespoon of the butter, grease the four cups down the center of a 12-well muffin pan. 2. In a bowl set over a pan of barely simmering water, melt the chocolate and the remaining 6 tablespoons butter, stirring occasionally until smooth. In another bowl whisk the eggs and the sugar until light and fluffy, about 20 seconds. Add the warm chocolate mixture to the egg mixture and mix until smooth. Then add the flour and mix until you no longer see specks of flour. 3. Fill the four greased cups with the batter (almost to the top rim, but not all the way). If not ready to cook, refrigerate for as long as 3 hours. 4. Prepare the grill for indirect cooking over medium heat (ideally 400°F). 5. Place the muffin pan over indirect medium heat and bake, with the lid closed, until the cake tops no longer jiggle when you shake the pan, about 10 minutes (or as long as 14 minutes if the batter has been refrigerated). Remove from the grill and let rest for 5 to 10 minutes. 6. Run a knife around the outer rim of each cake to make sure it is not stuck to the pan. On top of the muffin pan place a cutting board or a platter that is slightly larger than the pan. Holding the pan and cutting board together, invert them so that the cakes fall out of the pan. Serve immediately with whipped cream and raspberries. TIP: Each muffin cup in the pan should measure 2¾ inches in diameter by 1¼ inches high, and each should hold 4 ounces by volume. ©2013 Weber-Stephen Products LLC. Recipe from Weber’s New Real Grilling™ by Jamie Purviance. Used with permission.